2 Beds 1 Bath 540 Sq. ft. WOW!! !Amazing Hideaway at the Lake! 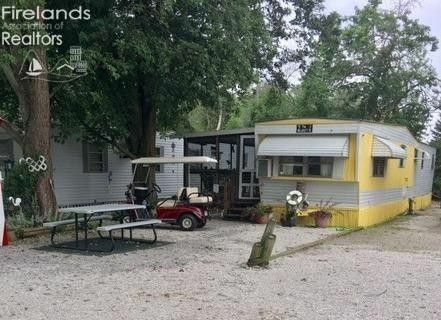 This 2 Bedroom mobile home is tucked away on the Portage River and INCLUDES MOBILE HOME, BOAT, BOAT TRAILER, Shed and GOLF CART...Gas Club Car. Completely furnished too!. PARK RENT is 1450.00 per season per Lot and includes a boat slip.Mobile home is all electric. (No Furnace) ....Uses space heaters. Fish CLeaning on premise for tenant use. Don't Wait to see this wonderful Getaway! Newer Rubber Roof on Mobile Home, Screened Porch and Back Awning. HWT approx 6-7 yrs. old. MH 1963 KROPE/// 54 X 10...Screened Porch 23X 10. Great Shed with Shelves, Refrigerator and Freezer stays. Boat is a 1989 27ft.Sportcraft...completely overhauled ...owner has had since 1990. Boat Trailer included LOADMASTER 1994. Ask for LIST of items that seller is Not leaving. PARK IS A SEASONAL PARK... Fee is 1450.00 year due Nov 01 and March 15. Water is off From Nov until usually April(no threat of freeze. Sewer is Holding Tank. 02-16-19 boat cushions being redone.